Created just for Diva Entertains - our shoe candle votive wraps are *gorgeous*! 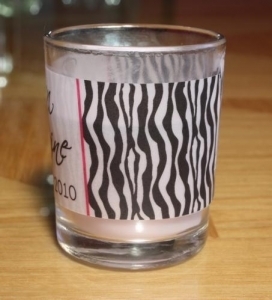 We provide you with the personalized vellum wrappers, an illustrated sheet on how to affix them to glass candle holders (easy, you just need tape) and we even provide you a list of local and online stores to purchase the glass votive holders and candles inexpensively*. Our beautiful vellum votive wraps fit standard glass votive holders that measure 2 1/2" h x 2" in diameter. CANDLES NOT INCLUDED – you will receive the VELLUM WRAPS ONLY. Please allow 10 business days to fulfill your order, then add ship time. *an example of where to purchase the candles: Michaels craft stores carry Ashland Basic Elements filled votives, 12 for $7.99. 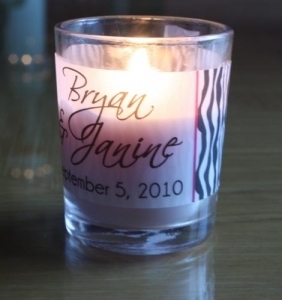 But with an online 40% coupon that can be printed as many times as needed, the candles are only $0.40 a piece. 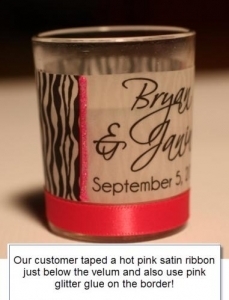 And with our vellum wrappers, each fully assembled wedding candle is less that $2 (slightly higher for place cards)!